New data released last week stokes debate about racial profiling in Berkeley, but chief won’t address whether officer bias is a problem. Berkeley Police Chief Andrew Greenwood at last night's forum. A new report released by the City of Berkeley has rekindled a debate about law-enforcement racial profiling in the famously liberal college town. The draft report, released this past Friday, was produced by the Center for Policing Equity, a nonprofit think tank based at the John Jay College of Criminal Justice in New York City. It supports longstanding community claims that Berkeley Police Department officers treat non-white residents with more suspicion. Among other findings, the report shows that Black drivers are nearly six times more likely to be pulled over than a white driver. Once pulled over, Black drivers are five times more likely to be searched than whites, and Latino drivers about 2.5 times more likely. Researchers also found that Black people are six times more likely to be subjected to use of force by a police officer than white people. 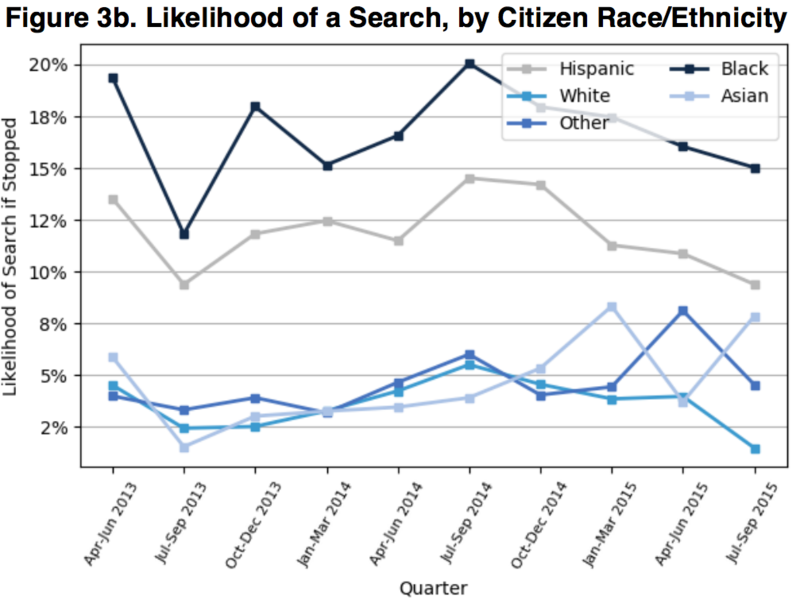 The report’s authors concluded that Black and Latino people experience “wide and unexplained racial disparities in search rates,” and “were disproportionately likely to be stopped and searched without being arrested.” This indicates that officers may be profiling and stopping Black and Latino people without having reasonable suspicion that a crime was committed. After initially promising to present the report to city council in May, Berkeley Police Chief Andrew Greenwood released the draft report without announcement late Friday afternoon, only after council directed him to do so. Greenwood maintains that the draft contains inaccuracies and unfairly portrays his department as engaging in racial profiling. He attached a five-page memo to the report, which criticized various parts of it. He said his department should have been given more time to provide the researchers with feedback before the report was made public. 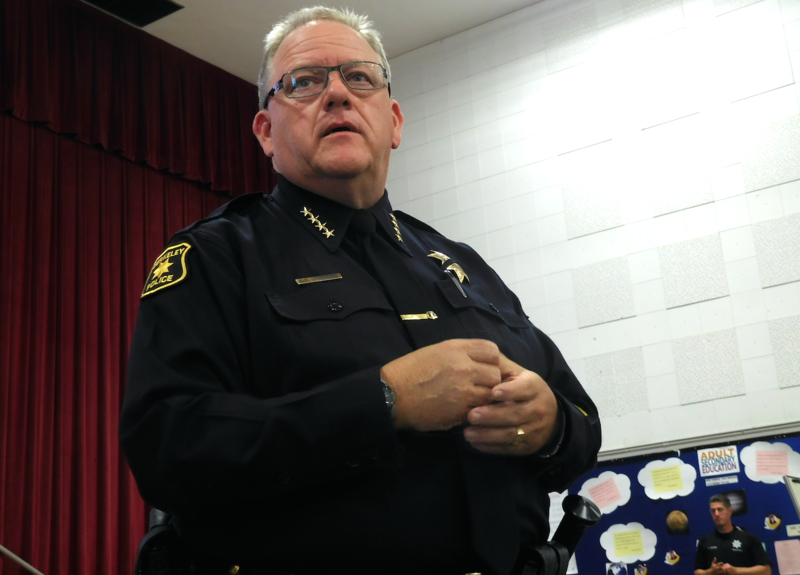 “My own sense, as a 30-year Berkeley cop, is that … we don’t have racial animus,” Greenwood said at a public forum last night. He argued that BPD is doing well compared to police departments across the nation. But many in the community say they’ve directly experienced racially biased policing at the hands of the Berkeley police. “They talk a good game, but they don’t really do it,” said LeRoy Moore, a longtime Black Berkeley resident, about the department’s claims of unbiased policing. Moore told the Express in an earlier interview that, several years ago, he was returning home late at night when two Berkeley officers approached him. “They came up to me on the sidewalk and stopped me, and, you know, they said they had a person who looked like me, a Black disabled man who robbed somebody,” explained Moore, who uses a wheelchair, or sometimes a bicycle, to get around the city. “They took my ID and I heard them laughing and mocking my disability,” Moore added. The officers eventually let him go, but not before offering him a dollar for the bus. Moore, a highly successful artist who recently had a show in the Whitney Museum of American Art in New York, was offended. He said this was only one of several times Berkeley cops have treated him with disrespect. At last night’s forum, one resident told Greenwood that several Berkeley police officers racially profiled her partner, a Black man from Africa, while he was working on his BMW in 2012. She alleged that officers pepper sprayed him and tore out some of his hair while detaining him on suspicion of stealing his own vehicle. “What in-depth education are officers getting on racial disparity and the history of race in the U.S.?” she asked Greenwood. The woman, who didn’t state her name during the meeting, said that her partner filed a complaint with Berkeley’s Police Review Commission, but she’s unsure if the officers ever faced discipline for their actions. Greenwood apologized for the incident, and assured her the department already has policies in place to prevent racial profiling. “Taking action against somebody purely based on their appearance is illegal,” he said. He pointed to an eight-hour course that includes a module on “really complex and tough issues of race in America” as an example of training that helps officers approach people without bias. “We expected there to be disparities, that’s the whole point,” Greenwood said about the findings of the draft report. But he maintained that these disparities aren’t necessarily due to racial profiling, whether through implicit bias or conscious discrimination. Greenwood also said the report incorrectly describes his department’s use-of-force policy. The CPE analysis described BPD’s use-of-force policy as inadequate. Specifically, it cited how Berkeley only requires use-of-force incidents to be reported when a weapon is used, a person is injured, or if a person files an official complaint. Regardless, Berkeley’s use-of-force policy is far less stringent than that of surrounding cities. Andrea Pritchett, a member of Berkeley Copwatch, agreed that the report contained some “minor” inaccuracies, such as how it describes Berkeley’s use-of-force reporting policy, but said that the data still shows “gross disparities” in how different racial groups are treated by the police. In the future, Pritchett said BPD needs to improve the data it collects. She also criticized BPD for withholding information, and for not doing enough to educate officers. 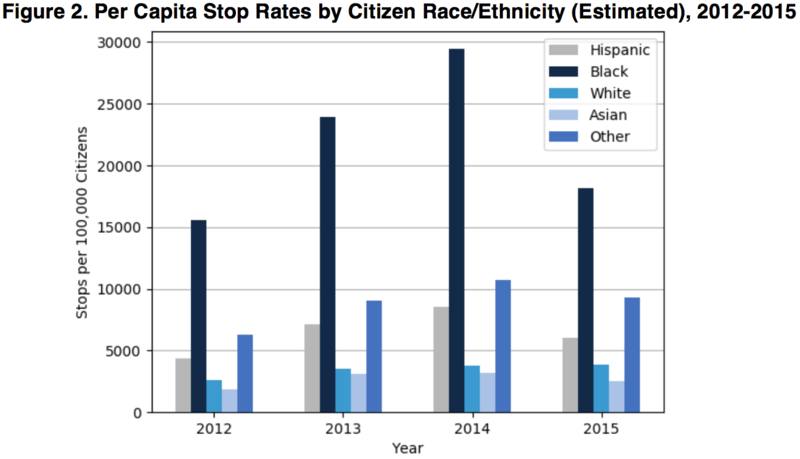 BPD first made its stop data public in 2015. At the time, the city’s Police Review Commission analyzed the data and reported a similar pattern of racial-biased policing when it came to stops, searches, and arrests. This prompted the commission to ask for further analysis. Councilmember Kate Harrison, who pushed to have the draft report made public, said that Berkeley obviously needs to update its use-of-force policy. She also said that the report raises many questions about racial disparities in policing — but stopped short of calling it racial profiling, using the term "racial differentiation" instead. She said the report showed clear disparities, however. "The report makes clear they’re not engaging in this more than other departments, but that doesn’t mean it’s not a problem and we don’t need to fix it,” said Harrison. Other councilmembers believe that the report is less ambiguous about causes and effects. Councilmember Kriss Worthington said that he has heard from many community members who are concerned about BPD’s practices. The report validates community claims of disparate treatment by the police, he argued. “It’s a real reflection of what happens in the real world.” Worthington said. In smaller buildings, property owners can move in (or fake to residing there) to circumvent rent control.